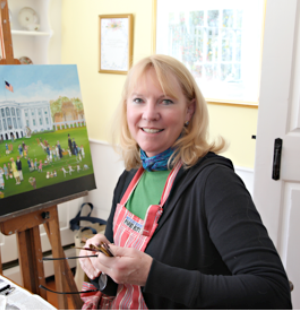 has been painting on Cape Cod since 1982, when she moved to the family house in Hyannis Port after finishing graduate school. She specialized in folk art oil paintings with words painted on a black border wrapping around the image. Elizabeth grew up sailing in the summers on Cape Cod on Beetlecats and Wianno Seniors and has always loved the most painting older classes of boats. Due to medical problems, since the summer of 2016 Elizabeth has been exploring watercolors. Some are large circle paintings with themes of wild flowers, wild life, sea creatures. She is also exploring underwater scenes involving mermaids, sea turtles, coral reefs, and fish, with a large dose of imagination. The text is in a white border. Since the summer of 2017, Elizabeth has been able to return to her traditional style with the black or navy border with text, and the center painting was done in gouache paint (a thick water based paint) on paper. Besides painting, Elizabeth enjoys gardening, golf, singing in a church choir, and volunteering with several nonprofit.